Mascot Engineering’s Heelguard Stainless Steel grating can be used for any number of applications, both internally and externally. Stainless Steel Wedgewire grating aids water flow while reducing the chance for unwanted debris from entering the drain due to its unique ‘V’ shaped wire. 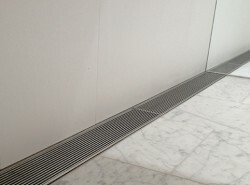 Most grates have a minimum 50% opening and can be manufactured in 304 and 316 grade stainless steel. 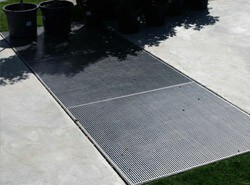 From elegant architectural design to ambitious water features, Mascot’s Heelproof grating can bring any design to life. Stainless Steel Grates aren’t just for your bathroom, the material is ideal for stairs, platforms, entry forecourts, driveways and swimming pools.